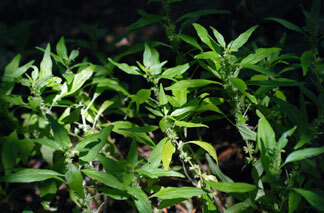 Parietaria pensylvanica (Willd. ) Muhl. Stems: Erect, ascending, or decumbent, simple or branched. Plants monoecious or polygamous, puberulent to pubescent, without stinging hairs. Leaves: Alternate; petiole 1/5 to 1 inch; blade lanceolate to elliptic or ovate, .8 to 3.5 inches long, .2 to .8 inch wide, margins entire, tip acute to acuminate. Flowers: Lower flowers usually bisexual and staminate, upper flowers pistillate; tepals 4, distinct; stamens 4; style persistent or not. Fruits: Achenes ovoid, 1/25 to 1/20 inch, loosely enclosed by tepals.